####Last call for fun This afternoon campers had one last rotation and it was tons of fun! They went to the climbing wall, the swing, and learning about nature. ####Lunch Lunch this afternoon was a cookout by the beach! Campers enjoyed hotdogs, chips, baked beans, and s'mores! ####Morning Fun This morning campers enjoyed activities like the AquaGlide and the swing. ####Discovery Time The campers learned about **walking with God** this morning. In their cabins they discussed how they could continue to walk with God once they left camp. ####Breakfast This morning the campers enjoyed breakfast pizza, cinnamon breadsticks, grapes, and cereal. ! [alt](/content/images/2015/07/thursday-friday-3.png) ####Vespers Tonight was the last night at Vespers. But it was a great one. Awesome song like [Holy Spirit](https://www.youtube.com/watch?v=eFByOX8Fb0M), [Here I am to Worship](https://www.youtube.com/watch?v=FaUTv1pXRyU), and [I'll Stand](https://www.youtube.com/watch?v=kV5iZBTNYrk). We talked about everything that happened this week at camp and what we learned about God. Like God is always with us even when we don't realize it and that God's plan for us is greater than we can ever imagine. Camp has been amazing this week and the campers have learned and grown so much. ####Wacky Water Relays Tonight the campers had some fun in the water doing relays with their cabins. One relay was a wet t-shirt race where they put on an oversize shirt, ran into the lake, then wrung the shirt out into a bucket then passed the shirt to the next person. Another relay they did was an over under relay with a sponge full of water. The campers had a blast during all of the relays. Make sure you check out the rest of the [photos](https://impact2818.smugmug.com/Camp-Lakewood/Lakewood-2017-July-1621/n-hThbmc/i-svKd9Wf)! ####Dinner Dinner tonight was chicken drumsticks, corn, potato smiles, salad, and a chocolate chip cookie. ####Afternoon Adventures This afternoon campers had tons of fun at things like the zip line, archery, swimming, and learning about nature. At the zip line, one of the campers said that they were scared said that they knew God was going to be with them the whole time and wasn't going to let anything bad happen. ####Lunch Lunch today was sloppy joes, potato chips, mandarin oranges, and salad. ####Discovery Time Campers this morning learned about working with God. They heard the story about Jesus feeding the 5,000 and how Jesus took two fish and 5 loaves of bread, blessed it, fed over 5,000 people, and still had 12 baskets full of food leftover. ####Morning Mix-up This morning was a little different. Discovery time and the morning rotation got flip flopped just for something different! Campers had fun at the zip line and the AquaGlide. ####Breakfast Breakfast this morning was biscuits and gravy, hash brown triangles, and cereal. ! [alt](/content/images/2015/07/wednesday-thursday-3.png) ####Vespers The songs we sang at Vespers tonight were [Give Me Faith](https://www.youtube.com/watch?v=P8PLBQrzWQ8), [Great are You Lord](https://www.youtube.com/watch?v=3jCnAAeEJSQ), [Set a Fire](https://www.youtube.com/watch?v=-Jzqq4B8H2Q). They read the book "The Tale of Three Trees". The three trees each had their own dreams of what they wanted to be when they grew up. One wanted to be a treasure chest filled with gold and precious gems, one wanted to be a big ship big and strong enough to hold a kings, and the third tree wanted to be so tall that when someone looked at it they would look to heaven. When they were chopped down, each tree was sad that it was not created into the thing they wanted to be. The first tree was made into a manger, but it held Jesus as a baby boy. The second tree was made into a small fishing boat not fit to sail the ocean, but Jesus was in the boat and calmed the waters that night. The third tree was cut down into limber and thrown into a pile and forgotten. But one Friday it was yanked out of the pile and nailed together into a cross. Jesus was nailed to the cross and when He rose from the grave, the third tree realized that when ever people would think of the cross they would look to heaven. All three trees realized those days that they were part of Jesus's life. ####Dutch Auction Tonights evening extravaganza was dutch auction. Before dinner each cabin gathered together a pillow case full of random items that they found in their cabin. During the auction, they had to find an item from their stuff that fit into the category that they were given whether it was a certain color or if they could communicate with it. the first three cabins to bring an item to the judges got points and an extra creative point was given out. ####Dinner Dinner tonight was chicken strips, potato wedges, cooked carrots, salad, and for dessert there was vanilla ice cream cups. ####Afternoon Activities The afternoon was full of fun. 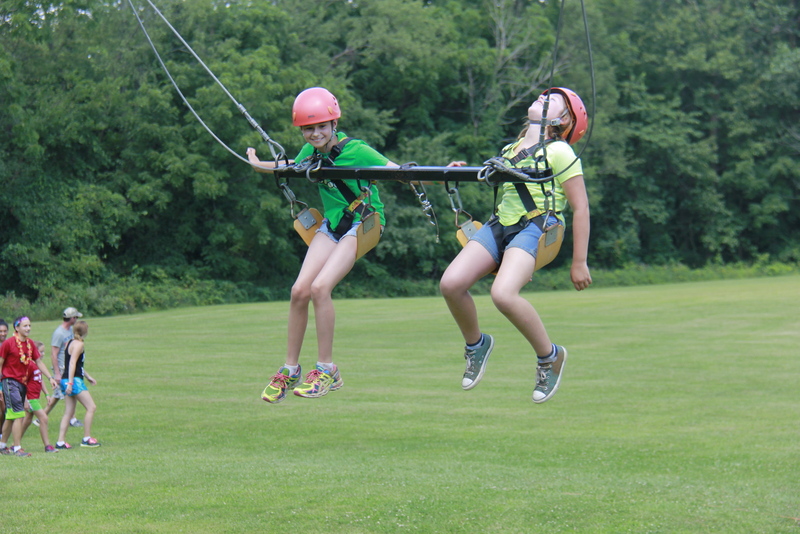 Some campers were able to experience the zip line and the swing for the first time today. Both activities were very much enjoyed by all whether it was their first time or their third. At the swing, they learned that they had to work together so they could all enjoy it. 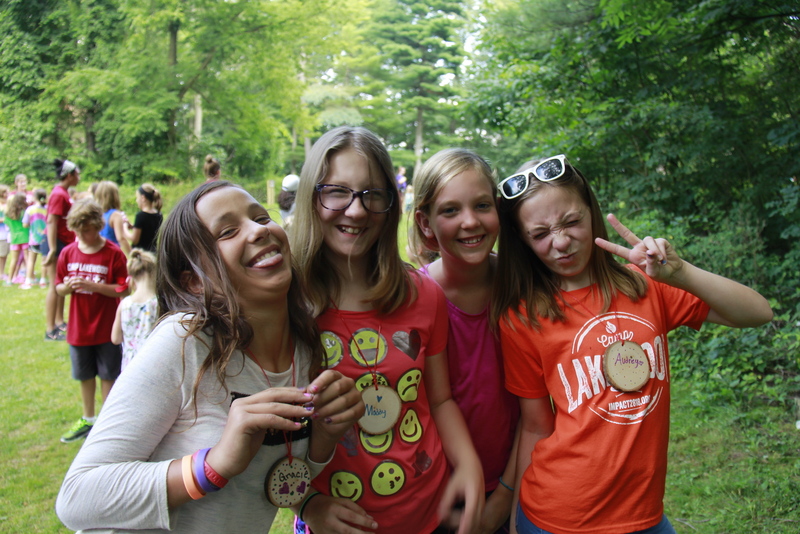 Don't forget to check out the rest of the photos [here](https://impact2818.smugmug.com/Camp-Lakewood/Lakewood-2017-July-1621/n-hThbmc/i-tsv7zQH)! ####Lunch Lunch this afternoon was corndogs, Mac n' cheese, applesauce, and salad. 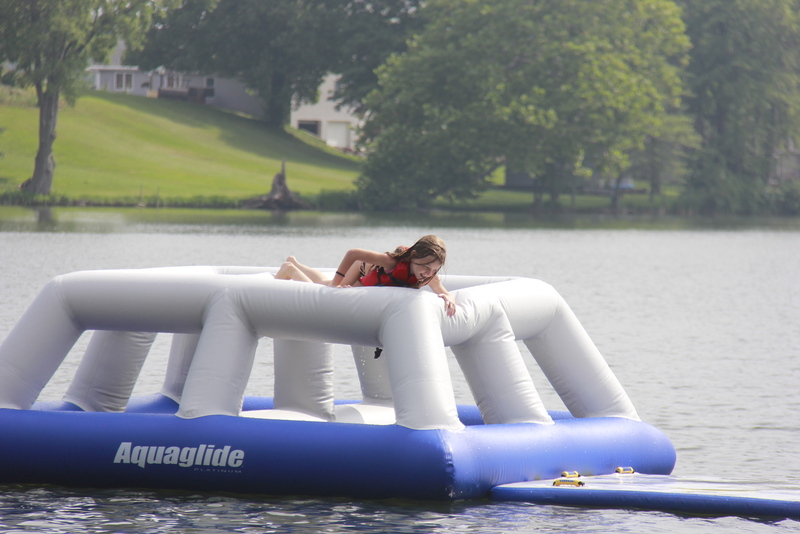 ####Morning Fun This morning campers enjoyed activities such as the AquaGlide and the swing. The campers are having lots of being with friends and doing fun activities. ####Discovery Time Campers this morning learned about the Parable of the mustard seed and how even though it starts out as a tiny seed, that it can grow to be the biggest tree ever. The mustard seed represents our faith in a way. It starts out small, but over time as we **grow with God**, our faith becomes very big and strong. ####Breakfast Breakfast this morning was French toast sticks, cubed potatoes, sausage links, and cereal. ! [alt](/content/images/2015/07/tuesday-wednesday-4.png) ####Vespers Tonight at Vespers they sang [Holy Spirit](https://www.youtube.com/watch?v=eFByOX8Fb0M), [I'll Stand](https://www.youtube.com/watch?v=kV5iZBTNYrk), and [Give Me Faith](https://www.youtube.com/watch?v=P8PLBQrzWQ8). They read from a book titled "Maybe God is like that too" and it talked about the fruits of the spirits from Galations 5:22-23 > But the fruit of the Spirit is love, joy, peace, patience, kindness, goodness, faithfulness, gentleness, self-control; against such things there is no law. In the book the little boy realized that God is everywhere and in everyone. Joy in swinging high, kindness in the doorman holding the door open for a man in a wheelchair, patience in his teacher helping and teaching him to tie his shoes. Self-control in going to bed instead of getting up and talking to his grandma. Through all of these things we learn that God is everywhere and we see Him all of the time even if we don't realize it right away. Evening Extravaganza tonight was messy games. The first game that they played tonight was a relay race where they had to sit on and pop a water balloon filled with shaving cream. The next game they played was drip, drip, drench, where they took a pitcher full of water and dripped water on their friends and then drenched one person. 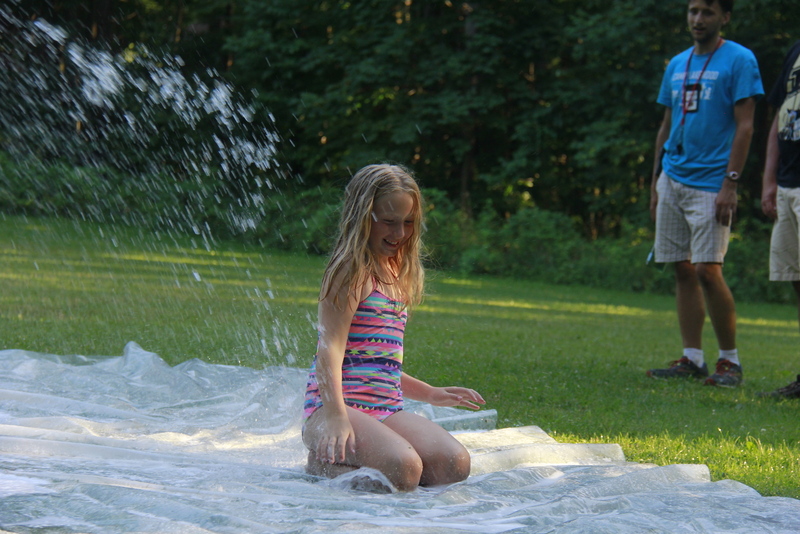 They even had a slip n' slide! The campers had tons of fun! Make sure you check out more photos! Dinner tonight was special! Cabin groups joined together at their cabins for dinner tonight with pizza, breadsticks, and for desert... S'more cones! The afternoon was spent having lots of fun with their cabins and with friends. 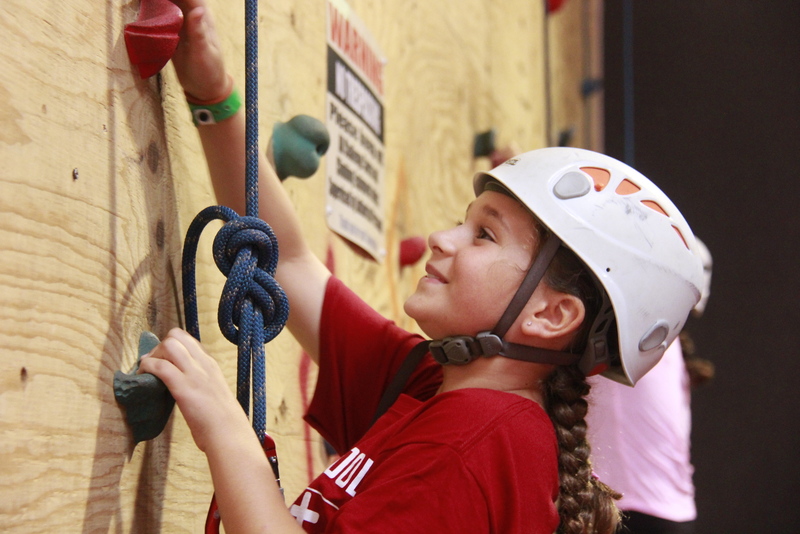 Campers went to the climbing wall, the zip line, and many other things. The cabins are all continuing to work together. Lunch today was tacos, nachos, and churros. This morning the campers had the opportunity to do activities such as the AquaGlide, the zip line, and the swing. At the swing they learned that they had to work together to get their cabin mates up to the top. This morning campers learned about the rebuilding of the temple from the book of Ezra. "Finish the job, give thanks to God" was a saying that they learned today to remember. For an activity they had modeling clay and were able to use it to be creative and make an object. The campers learned to build with God. 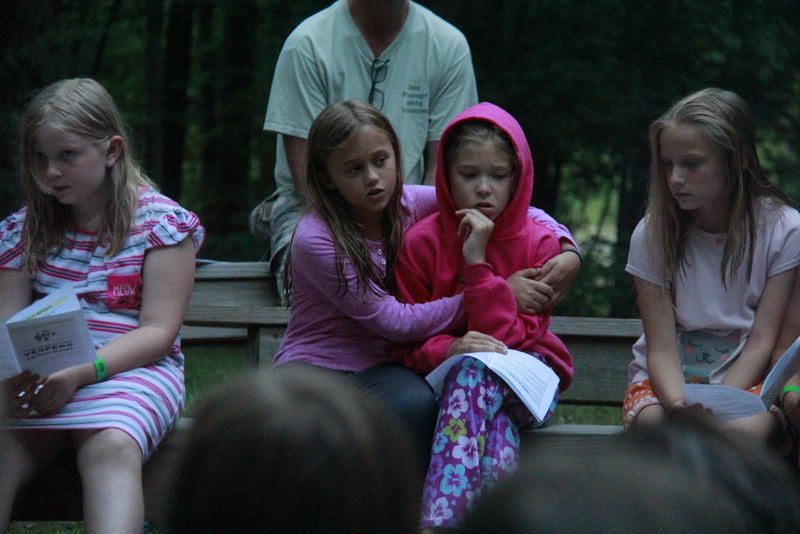 At Vepser Hill tonight the camper shared how they imagined with God throughout the day at the activities that they did. One camper shared that they used teamwork and creativity at the adventure trail as they lifted their cabin mates through a tire. The songs they sang tonight were Here I am to Worship and Great are You Lord. Tonight campers enjoyed some friendly cabin competition with an egg race, a three legged race, and a giant puzzle. 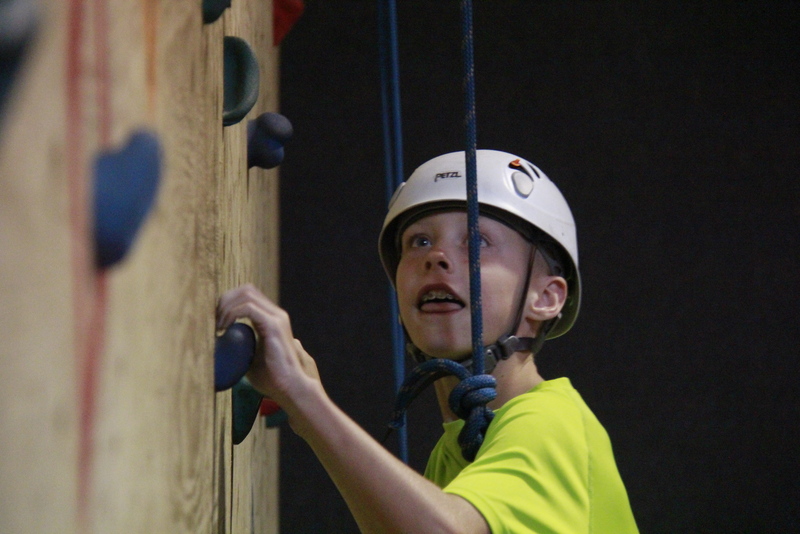 Campers learned that they had to use a lot of teamwork and encouragement with one another. Dinner tonight for the campers was lasagna roll-ups, green beans, breadsticks, and salad. 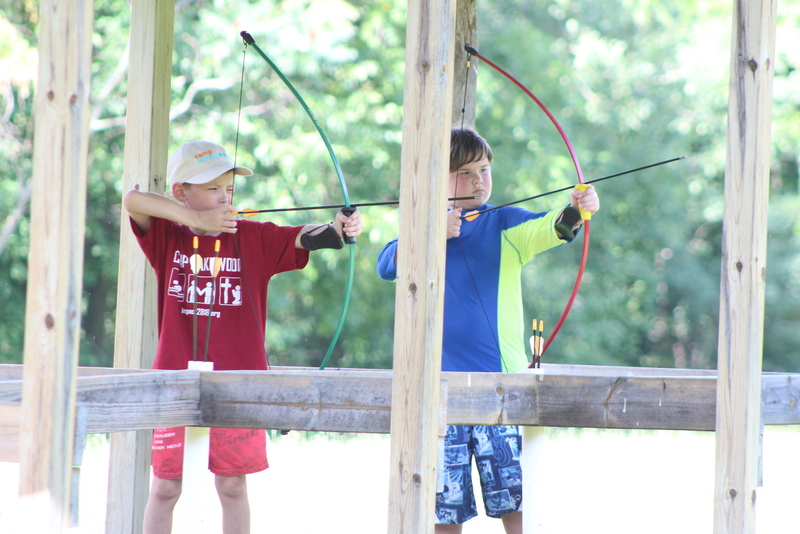 Campers this afternoon enjoyed activities like swimming, the zip line, the adventure trail, and archery. At archery campers found it sometimes difficult. One camper even said that it was hard because the arrow doesn't have a GPS. Don't forget to check out the other photos! Lunch this afternoon was breaded chicken sandwiches, tater tots, peaches, and salad. 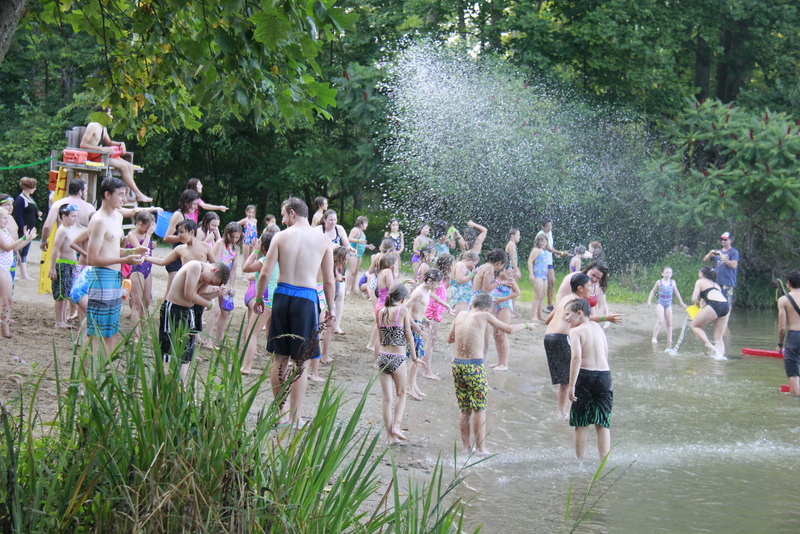 Campers this morning embarked on some wonderful adventures at the water and the swing. At the swing, some conquered their fears and they loved it! ####Discovery Time Campers this morning learned about Esther and how she saved her people. Esther **imagined with God** to find a creative way to tell the King about Haman's evil plan to kill her people. ####Breakfast Breakfast this morning was blueberry pancake and sausage on a stick, crispy potato cubes, grapes, and cereal. ! 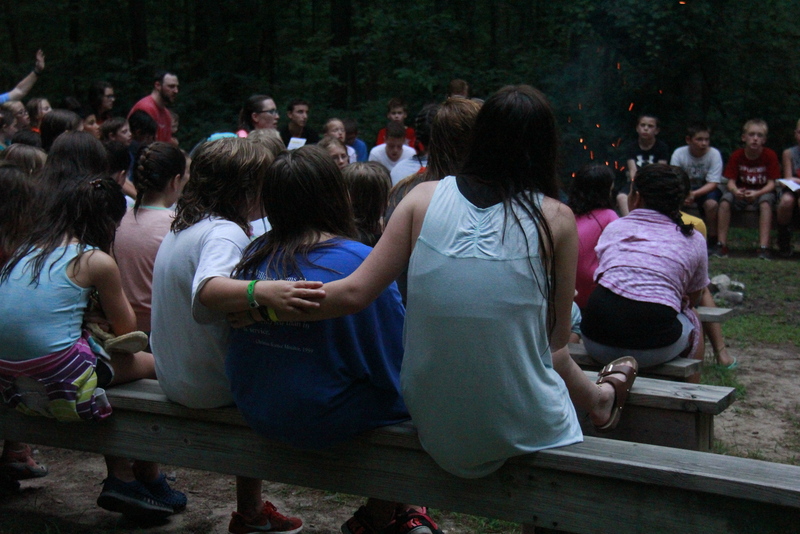 [alt](/content/images/2015/07/sunday-monday-2.png) ####Vespers Vespers at Camp Lakewood is a special place. 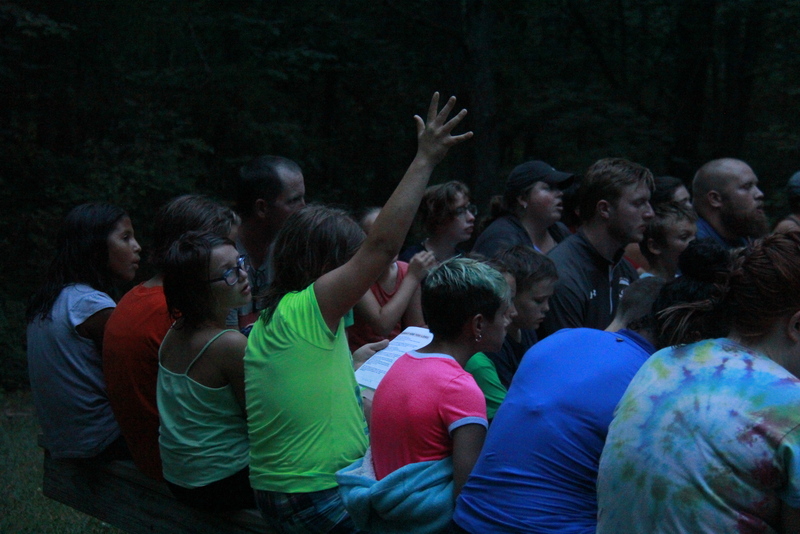 It is the time when all of camp gathers at Vepser Hill and sings songs and learned about God. Tonight the songs they sang were [Holy Spirit](https://www.youtube.com/watch?v=eFByOX8Fb0M), [Set a Fire](https://www.youtube.com/watch?v=-Jzqq4B8H2Q), and [Great are You Lord](https://www.youtube.com/watch?v=3jCnAAeEJSQ). Tonight they read from a book titled "When God made you". In it it talked about how we are always on God's mind and that we were made in the image of God. We are always called to love one another. "You being you is God's dream coming true." ####Dinner Dinner tonight was hamburgers, French fries, applesauce, and salad. ####Check-in Check-in went great and all campers are here and already having tons of fun! This is going to be a great week!